I wish I've been doing a lot of front porch sittin' lately, and that it's why I haven't posted on the blog in nearly a week! But alas I've been swamped with work and preparations for the in-laws who just visited this weekend. Every time I want to work on my Etsy shop or put together some posts, I think about the long to-do list I have sitting in my office and decide to be responsible. I did get a couple minutes to make a few improvements on our front porch, though. It needed some help and I'd been wanting to get a bench ever since we moved into our house. 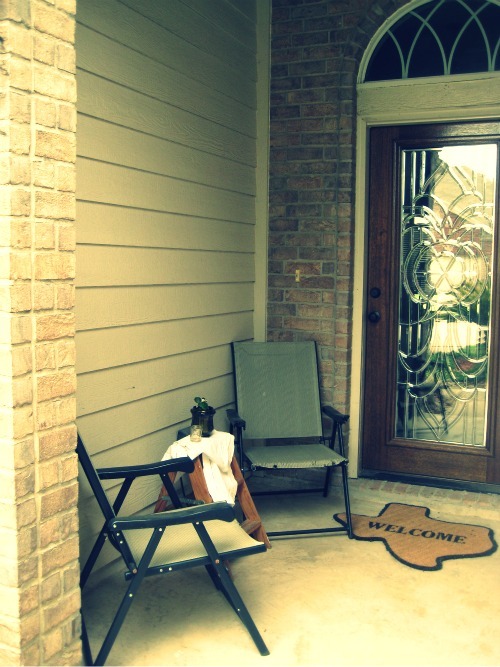 That mixed with some new flowers, a DIY chalkboard paint-pot and housewarming gifts from friends equals a much prettier porch, perfect for sittin'. Just having a nice bench makes such a difference, and I love the pattern of the bench cushion as well. Both items are from Garden Ridge, the oak bench was on sale for $40 (normally $80) and the cushion was $25. I replaced the plastic hanging pot with a much more eye-pleasing version that I scored at Big Lots for $5. The pink geranium is from Houston Garden Centers and was on sale for $2. I have been trying to think of ways to use my chalkboard spray paint again, and when I spotted this terra cotta pot for $6 at Garden Ridge, I instantly envisioned a chalkboard welcome sign on the front. 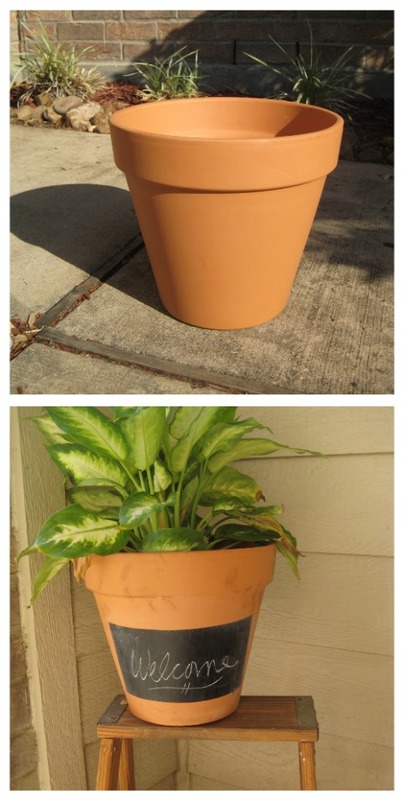 I used painter's tape to tape off a large rectangle and covered the rest of the exposed pot with newspaper. Then I sprayed two coats of the chalkboard paint, letting it dry in between. Some of the paint seeped down on the bottom, but a little sand paper (my husband's genius idea!) got it right off and you can't even tell. Then I took a piece of chalk and rubbed it all over the painted square, wiped it off and scripted my message. This weekend, we did quite a bit of grilling, including some delicious shrimp fajitas for mother's day today. I'll have a weekend recap coming up soon, along with an event for Manolo Blahnik and some new additions to my Etsy shop, Texas Take. Looks like a great weekend to me!! I adore that Texas wreath! It is so Y'ALL!!! Was that the one from Carla? If so, that is so like HER!! You did a good job on the porch! Louis Dean and I will be sitting out there sometime in June I hope. That's our anniversary month. Glad you liked the wreath. 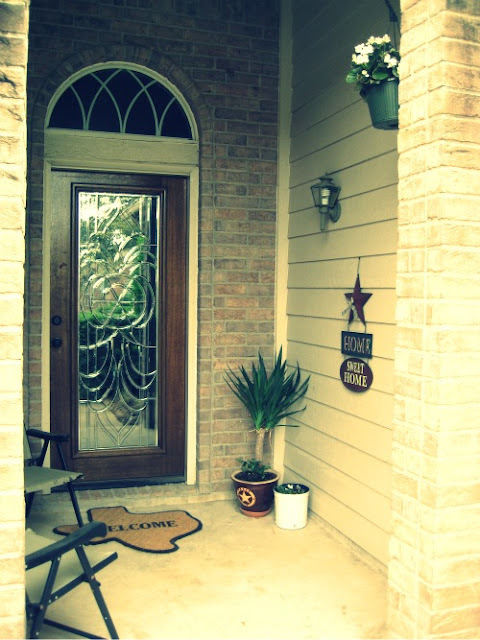 The front porch looks very inviting. Like the Welcome on the flower pot idea too. Showing up the big dogs. Daily Pics: Manolo Blahnik to Crawfish!